Edit: could you try replacing the mod's jar with this one and see if that fixes it? Unfortunately this bug is hardware dependent so I can't test the fix myself. Replaced it, unfortunately same error. I'm about to leave to spend the day with family, so if that one doesn't work you can use this jar as a fallback until I can get back to a computer (rename it to lw_Console.jar). That one doesn't properly fix the bug, but simply papers over it by providing a large enough buffer that it shouldn't occur. Also, just to make sure: you're using a Mac, right? If not, then I'm trying to fix the wrong thing. Sorry, should have guessed it is OS related and told this earlier, given no one mentioned similar problem since the release. Tell me if i can do something to help in debugging. Just be aware that my java skill is somewhere around the power copypaster level (script kitbashing based on logical guessing). Alright, I'm pretty sure I spotted the error. Could you try this jar and see if it works now? Excellent. Thanks for testing it for me! 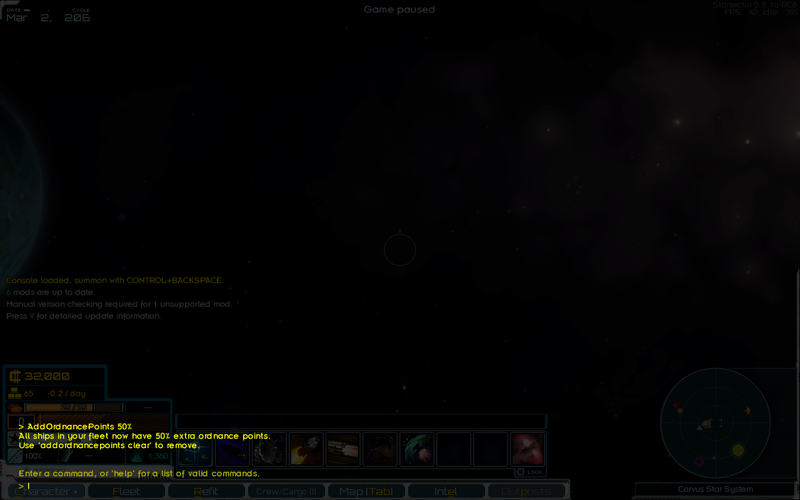 For anyone curious: the culprit was the console overlay's background (a darkened screenshot of the game). Initially I thought the crash was due to some Retina display compatibility code, but the real problem was that the native buffer the screenshot was stored in was dynamically sized based on your monitor's display settings, but the actual screenshot was always stored in a 32 bit per pixel format. That explains why this hasn't shown up before now: the buffer would only be too small if you ran the game with a sub-32 bpp display mode, which I didn't even think was possible with Starsector. the buffer would only be too small if you ran the game with a sub-32 bpp display mode, which I didn't even think was possible with Starsector. 24bit depth is actually pretty typical for Nvidia Linux drivers. If you're still taking requests, can I ask for AddOrdnancePoints to have a percentage component? So +20%OP instead of a flat number. Edit: added. If you don't want to wait for the next WIP, replace the jar in the mod folder with this one. Adding a percent sign at the end of the argument makes the bonus a percentage rather than flat. Holy crap, it took you a minute to answer and 10 minutes to code and upload. Thanks so much! That's amazing. Your name is only half true. Another hopefully quick suggestion - Could the Storage command have a counterpart SetStorage added? You'd have to verify there's a valid storage at the station to use, but it'd be a lot more convenient than having to transfer the contents of the abandoned station when arriving at "home". Or, thinking of it, SetHome could check for a valid storage and set it then. I'll see what I can do. I won't be able to release anything today, though. I've been messing with the internals of the mod and I'm not sure if it's stable enough to release in its current state. While in a text field in the Refit screen, pressing control-backspace currently opens the console instead of backspacing a word. While not game breaking, it is an annoyance during ship and variant renaming. I haven't noticed it anywhere else (yet). Yeah, being able to open the console inside campaign menus was an oversight. It'll be fixed in the next version. Can I us this mod to teach myself the salvage gantry hullmod? I want to 'learn' it now I've reached salvaging skill 3 but it doesn't seem to be on the list for the AddHullmod command.